Thanks to Nancy White of Full Circle who did a fantastic job blogging the 2007 International Forum of Visual Practitioners Conference in Santa Fe, New Mexico. ... 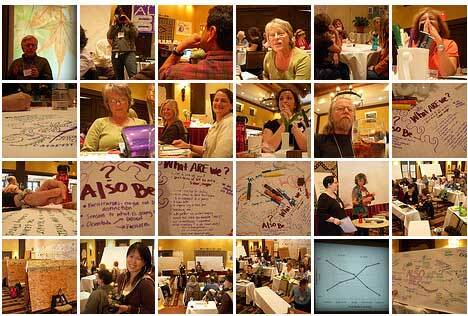 I have been immersed in a new tribe: the Visual Practitioners. People who listen with amazing depth and bring peoples words into a new life in images on the wall. Some are graphic recorders who focus on accurate capture of conversations. Some are graphic facilitators who use images as part of a group process. Some, like me, recognize and thirst for the ability to use image in our work - regardless of that work. Read more of her reflections on the presenters and rich conversations on the Onfac Blog. Visit Nancy's Flickr account where you can see photos and a slideshow of the talented participants and the mindmaps, illustrations and wall maps they created. Full Circle is the consulting practice of Nancy White and a network of independent professionals. Using communications as our center point, they provide strategic communication, online community development, facilitation, marketing, and project management services for the community, non-profit and business sectors. They do business in geographic and cyber-spaces.